I was lucky enough to be asked to write an endorsement for this book, and was sent an uncorrected proof to read. Now I have the full color, published version, and I’m poring through it once again. Andrew Mefferd is the editor and publisher of Growing for Market magazine that I sometimes write for. Prior to that job, he worked at Johnny’s Selected Seeds, in the research department for seven years. Born in Virginia, he apprenticed on farms in six states on the west and east coasts, then farmed in Pennsylvania. He now farms in Maine, and has a good appreciation for the difference a different climate can make. This is not an “Everything you always wanted to know to get started with a hoophouse” book, nor a compendium of greenhouse crops, pests and diseases. 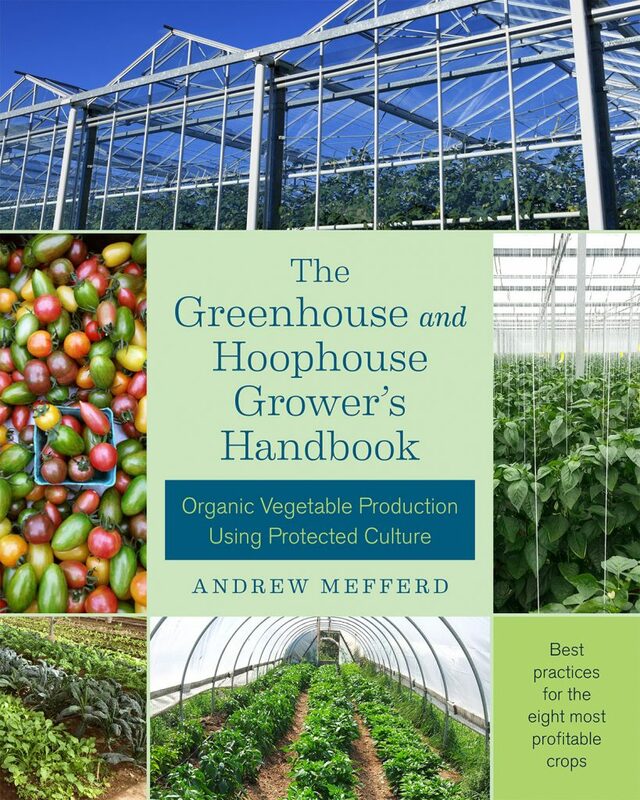 On the contrary, this book focusses down on the precise details of successful practices to grow what Andrew has determined to be the eight most profitable crops using protected culture: tomatoes, peppers, cucumbers, eggplant, lettuce, greens, microgreens and herbs. This is a book to come back to each time we want to know more about one of his topics. If I were about to launch into microgreens, I would follow Andrew’s methods. I tend to read quite widely on vegetable growing topics and I’ve read some very fussy time-consuming microgreens-growing instructions for home gardeners. I haven’t seen another book be so down-to-earth with an efficient and professional growing method that uses only simple tools and supplies. Those wanting to grow microgreens in quantity, and make a living from it will find plenty of information to get started or to fine-tune their operation. The part of the book I’m most excited about right now is the information on what plants need at different stages of growth, in terms of balance between temperature, humidity as it affects transpiration, daylength, light intensity, carbon dioxide, oxygen, water and nutrients; and how to use this information for “crop steering” – adjusting conditions to select for leaf growth or fruit development. Here are the details to get it right. I once got a light meter to compare the light transmission through clouded old glass and new glass (I wanted to know if it was worthwhile to replace the glass in our greenhouse). But then I didn’t know how to use the information. Now I know that 1% less light will lead to about a 1% lower yield. Specific information like this can be hard to dig up bit by bit on the web. Here the gold nuggets have been screened for us, and the mud left behind. The book starts off with a sixty page section on the basics of protected culture: the why, what and how of the various options of structures and utilities you might be choosing among, with a chapter on economics and efficiencies. The main part of the book then dives into the specific practices that help the eight crops do best. 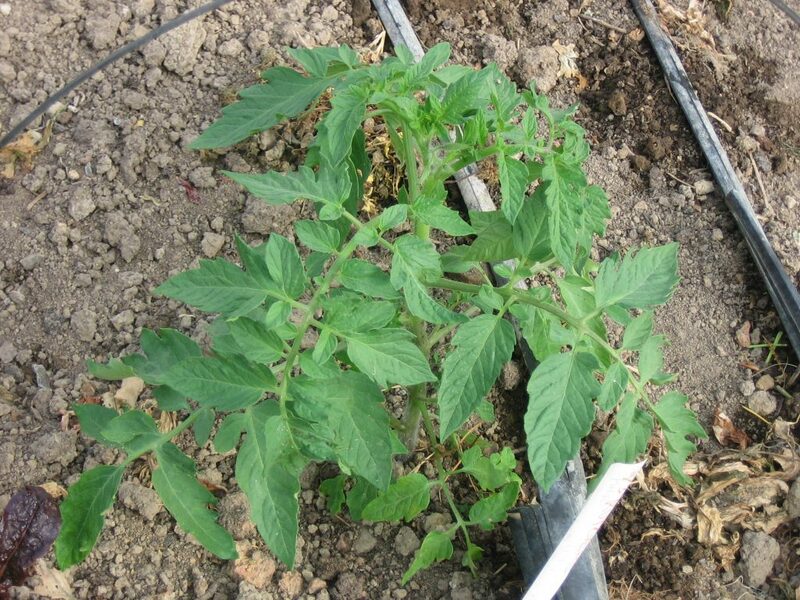 Chapters on propagation, pruning and trellising; temperature control and crop steering; and grafting are applicable to many of the recommended crops. 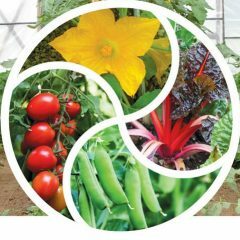 Next follow chapters on each of the crop groups, and appendices on hydroponics, pests and disease and tools and supplies. Andrew is obviously a very attentive farmer, and one who keeps good records. And here we can all benefit, whether experienced growers looking to improve our game, or beginners wanting to grasp success from day one. Serious backyard gardeners could use this book too, not only commercial growers. Facts are facts, results are results. Not everyone will want to follow all of the recommendations immediately or perhaps ever. 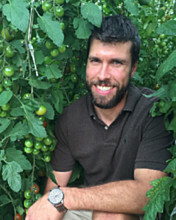 In our hoophouse in Virginia, we grow two beds of early tomatoes in our hoophouse with just enough trellising to keep them upright, and minimal pruning. As soon as our outdoor tomatoes are producing well, we pull out the hooophouse rows. Our climate doesn’t warrant keeping them in the hoophouse, and in fact, it may get too hot in there for them. Our climate is full of fungal diseases, so crop rotation is very important to us, and the sooner we don’t need tomatoes in the hoophouse, the sooner we can remove them and their fungal spores! But I do remember growing tomatoes in a glass greenhouse in northern England, and how we cherished those plants! I had started to experiment with side-grafting 25 years ago, in hopes of having sturdier tomatoes. We pruned and twined, and every ripe tomato was precious to us. It was late September when I moved to Virginia, and I helped the garden crew harvest Roma paste tomatoes, which were grown sprawled on the ground. That in itself was a shock – gosh these people don’t hold their tomatoes in very high regard, they let them rot on the ground! The crew member working next to me shocked me further: “Stomp on the green ones” she muttered under her breath. Apparently so great had been the harvest of these paste tomatoes that the crew was exhausted from harvesting and wanted to be done! So, select the sections of Andrew’s book that speak to your needs and your climate. There’s something for everyone. You don’t need to abide by it all to want the book. It will easily pay for itself if you find only one new practice to adopt this season. But read the whole book anyway, and you can develop a fuller understanding of the big picture, a new management strategy and a set of skills to deal with the challenges that arrive unbidden. Andrew has tested all these practices as a small-scale grower himself, and he does this because he’s a passionate supporter of local food, sustainably grown, and sees protected cropping as a way to increase local food production by increasing on-the-ground crop insurance in the face of the unpredictable. Young tomato plant in our hoophouse in April. Thanks for sharing this review. I have this book on my “buy-soon” list! I found your comments about your early tomatoes interesting. I don’t recall reading in your book that you remove the hoop house tomatoes as soon as the outside tomatoes are coming in. This is our first year with a hoop house and while the young tomato plants look great, this week it’s been over a hundred degrees in there even with the sides down. I can only imagine what it will be like later this summer! We’re going to plant tomatoes outside too, but I had planned to keep the ones in the hoop house going as long as I can. Will play it by ear now, while keeping a lookout for disease issues. Thanks for sharing all the great info. We used to keep our hoophouse tomatoes going later, back in 2012 when I wrote the book. But the yield drops off, and we decided it was more effective to grow something else. We also do put a large piece of shadecloth over the hoophouse (any day now!). Do you use shade cloth?